Jonathan Pollard's life sentence for the crimes he committed nearly 30 years ago is, without a doubt, both a travesty of justice and completely disproportionate. 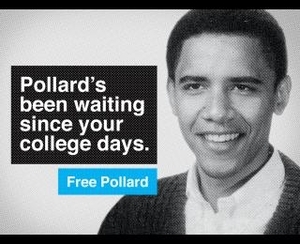 Indeed, I offered Pollard advice and help when he called me from prison for some years in the mid-1990s. For example, I published an original document about his trial in 1997 and evinced new information about him from Caspar Weinberger in a 1999 interview. I have maintained a weblog entry exposing the rank hypocrisy of U.S. leaders who come down so hard on Pollard even as American intelligence services spy no less, and probably much more, on Israel. I mention these bona fides because I do not want Barack Obama to pardon Pollard. One of the more creative free-Pollard signs. While delighted by this prospect for the prisoner and his family, after so many years and so much emotional freighting, his pardon will certainly carry a high strategic cost (just as did the release of Gilad Shalit). I expect an exorbitant price in the currency of Israeli concessions toward the Palestinians or even toward the Islamic Republic of Iran. Cool U.S.-Israel relations have their benefit when Obama, Kerry, Hagel, Brennan, and Rice are running the foreign policy show. Mar. 23, 2014 updates: (1) Israel Radio reported today, citing Western diplomatic sources, that "Obama administration officials have not ruled out Netanyahu's proposal that Pollard be released in exchange for Israel's agreement to free Israeli Arabs convicted of terrorist acts." The seriousness of the situation has led to renewed discussions over the possible release of Jonathan J. Pollard, an American serving a life sentence in North Carolina for spying for Israel, which those involved in the process see as a powerful card that Washington wants to play at the right moment for maximum effect. Mar. 26, 2014 update: Jonathan S. Tobin makes this case in more detail at "Pollard for Murderers? A Bad Deal." Apr. 1, 2014 updates: (1) Contradictory signals have come from Pollard himself as to whether he supports or opposes his own release in exchange for convicted Palestinian murderers. Gil Hoffman reports in the Jerusalem Post that "well-placed sources" say he "would not turn down an opportunity to receive presidential commutation of his life sentence as part of an agreement in which Palestinian and Israeli prisoners are released. … They vigorously denied reports that he had rejected a parole hearing due to opposition to being included in such a deal." Morton A. Klein of the Zionist Organization of America quotes Pollard saying, "Mort, make it clear to the Israeli officials not to make any concessions, not of any land, or of freezing construction of Jewish homes in Judea/Samaria, in order to obtain my release." (2) David M. Weinberg agrees with my argument in his article, "Reject the Pollard-for-prisoners deal."